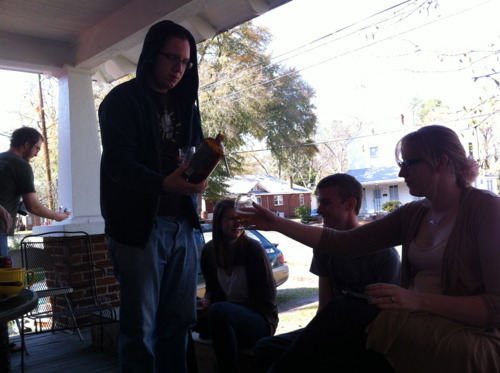 On Bottle Shares | Drink. Blog. Repeat. 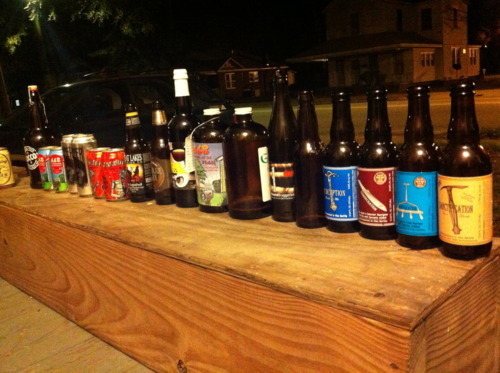 About a week ago, a group of my friends and I got together to welcome another friend back to town the only way beer geeks should: With a massive, all-day bottle share. With the temperatures in South Carolina rising, it was a perfect opportunity to bring new and old friends together on the porch to share in the fun. The visting friend was down from Connecticut and brought some Northeastern goodies: Treogs’ Nugget Nectar, The Alchemist Heady Topper and a wealth of stuff from New England Brewing – where he works part time – including Imperial Stout Trooper. A local beer geek broke into his stash and brought out plenty of goodies as well: Russian River Supplication/Redemption/Consecration/Sanctification, Cigar City Marshal Zhukov’s Imperial Stout and Guava Grove and lots more. It was, in short, a good day. It was also ironic timing since the day before, I was visiting a friend in Atlanta when the subject of bottle shares came up. 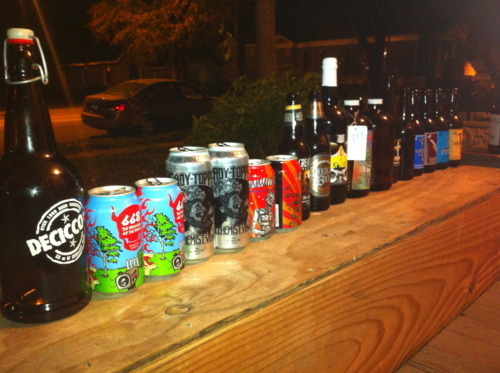 In his mind, his stash – which I found really impressive – was weak compared to his super beer geek friends. He told me when he went to bottle shares, he felt like he wasn’t pulling up his part of the bargain and that others may feel underwhelmed. That got me thinking: What, exactly, is the point of a bottle share? To me, if you’re sharing your stash with a group of friends in an attempt to show off in favor of introducing people to something they might not try otherwise, you’re doing it wrong. 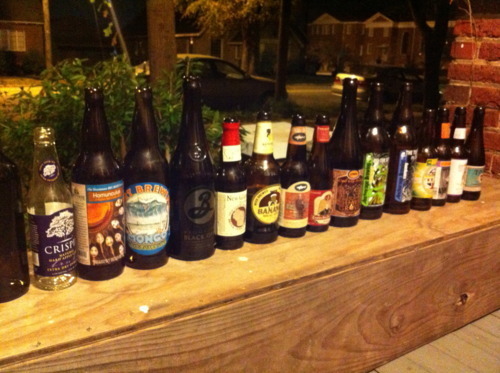 Bottle shares are a time for beer geeks to get together, commiserate and pop open a few (dozen) bottles of really great beer. Everyone has a different palate and picks up on things the person next to them might miss. Maybe you can introduce someone to something new, or a style they might not be familiar with, or something they might not have enjoyed in the past. But first and foremost, it’s about sharing great beer with great people. Which brings me back to that Sunday. Looking at the lineup – I’ve posted a couple photos below – I was amazed at how much good beer I was able to try, and how many things I was able to mark off my to-drink list. But what was even better was the people I was with. Around midnight, when I was heading out and saying my goodbyes, the visiting beer geek gave me more to take home, including a pack of Nugget Nectar and a bottle of Heady Topper (which was one of the best IPAs I’ve had). Another friend refused to trade with me, not because he wanted to keep something for himself, but because he didn’t want me to lose something of mine when I could just drive across town and drink with him sometime.